the Philippines being an archipelago located just above the equator, one will definitely expect that it has the best islands. i believe, exploring intricately each of the 7,107islands will require a lifetime. yet people seem to have already found the best beach in one its islands. Boracay. 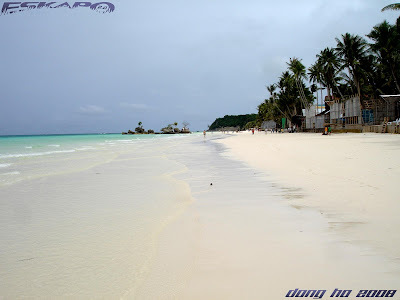 what makes Boracay’s white beach different from the other beautiful beaches in the Philippines is its long and wide stretch of fine powdery white sand on one shoreline. 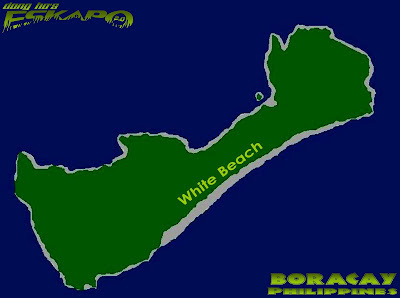 the central Boracay beach front or sometimes called white beach stretches to about 4kilometers. the central beach area is divided into three stations. people who've been to the island will definitely agree that the widest part of shoreline is station one. it can reach to about hundred meters during low tide. making it a perfect venue for large beach activities. from the many beaches that i’ve visited, i believe that Boracay has the finest sands in the archipelago. walking barefoot along the shoreline will tell you how fine the sand is. people flock in thousands during weekends making the beach look smaller. by night, this part of the island transforms into a party beach. bars and restaurants of different sorts are filled with people. palm trees growing through time still dominates its beach front view. these trees are witnesses to the changes that this side of the island has undergone. from a backpackers getaway to a world renowned beach haven. hundreds of thousands of tourists visits Boracay every year and it was noted that approximately 35% are foreign tourists. 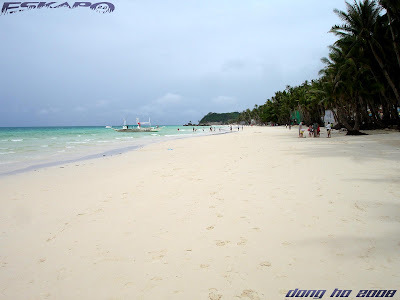 more posts about Boracay in the coming days. I wish your posts came with airfare! Lovely beach. Did you find any couples running slow motion on the beach just like in the movie...lol. the beach is not 1 km wide at low tide. maybe 100m. it used to be more but the rising sea level, the missing protection from destroyed coral reefs and the increased intensity and frequency of typhoons are eating quickly on this beach. >hi ailee, you'll definitely have your chance if you really want to see it. >hi rebecca, no problem. boracay is indeed world class. >hi sandy, hahaha... good idea! >hi alicesg, you made me laugh. i believe it doesnt really happen. >hi ecowatch, thank you for clearing some things here. i already edited the post. i learned a lot from your blog when i checked it just today. thanks for dropping by. i hope you'll keep in touch. Yes, from your photos the sand looks splendid. What a wonderful beach! How did you do? I don't see anybody on the beach? How beautiful! I think I've only ever been to one beach in my whole life that has such white sand. nawindang ako sa word verification. LOSER. hahaha. ampf! galit ata sakin blog mo. haha. Another post of this pretty island again, really nice! I think everyone will look handsome and pretty in the photo with such beautiful backdrop! Hey, Singapore is an island, is separated from Malaysia! I read wikipedia and I thought it's Indonesia that is the southernmost point of continent Asia. Hmm , maybe I should email Sentosa to ask about it hahaha. Thanks! >pietro, wonderful boracay island it is. >sidney, maybe because it was off peak season when i was there and it was not in a weekend. hehehe... i believe that i was quite lucky to have seen it that way. i took these shots around 2pm and people usually go to the beach around 4pm. >hi karen, i wonder what that beach is. >hi josh, hehehe... abusado pala ang word verification na yan. >hi eunice, you're right! everyone will definitely look really good with that backdrop. Wishing you a "Happy, I love To Write Day." By the way i'm a friend of rajesh which you could observe from my url itself.I would like you to visit my website at your free time.I'll also return my favor.I've also added you in my blogroll. boracay has it all. napakadaming pwedeng gawing activities dun day in and day out. hope i could get there soon. kuya dong may pics ka dun at night? maganda rin daw kasi dun pag gabi. Who would not want to spend precious moments in Boracay? The sand is pristine. The water is just like you see it on postcards. Thanks for visiting Norwich Daily Photo and leaving your comments. Are you looking forward to the week ahead? 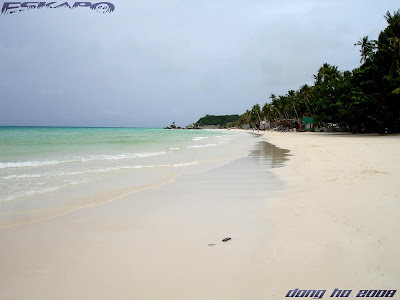 I've seen lots of photos of Boracay on travel magazines, but they never showed the vast white sand beaches like you do. Great work! >hi satya, thanks for adding me in your blogroll. ill be passing by your blog. >hi share, you'll be accused of minimal robbery case for that. just kidding. >beero, ganda talaga. isa yan sa irerecommend ko na dapat mong puntahan. just keep in touch for some tips in the coming posts. meron din akong mga kuha sa gabi pero hindi ganun ka dami. hopefully it will be posted. >hi borneo falcon, you'll have that chance once you visit the philippines. >jm, thanks a lot. truth is you'll even be impressed when you see it yourself. the pictures that we see in postcards and magazines can only describe a bit of its beauty. Hey Dong, I just posted a ghost story in my travel blog. I hope you have the courage to read it..lol. Nakakapagod maglakad sa buhangin. malawak na area talaga ang station one tas sosy siya. lol. may inuuwi akong bora sand ng pumunta ako dun. Nakakasawa rin ang bora kapag you stay long. Same scenario makikita mo lalo na sa gabi. Pero maganda talaga siya kapag nature ang pag uusapan. maaapreciate mo talaga. I fell in love with its white sandy beaches the very moment I set my eyes on them. Unfortunately, I haven't had the chance to come back. I'd love to do so again someday. What a beach my God! Fantastic! wow, four km of white sand, that's a "walk in the beach". 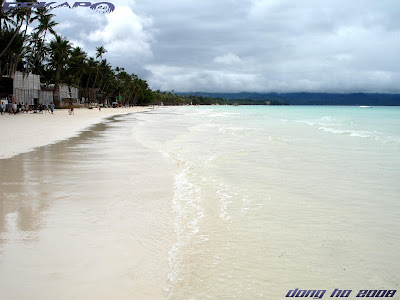 Each time I see pictures of Boracay beach I'm amazed with the clear waters and extremely cleanliness of it. It's gotta be on the top list of beaches around the world. it would be a nice momentary escape from life. Cool, any resorts on boracay island?? >jericho, sana matuloy ka pa rin. imibitahin mo ibang mga barkada mo. sayang din. >nanay belen, sana nga. ganda po talaga doon. >hi alicesg, ill definitely check it. >redlan, ganda nga sa station one dahil sa lawak ng patag na buhangin. kakapagod nga ang maglakad mula station 3 hanggang 1. para hindi magsawa dapat explore mo rin ang ibang side ng boracay. meron na ding carabao island. >hi mimi, wala nga nung nandun kami. we're happy! >panaderos, maybe next year will be the year for you to visit. >philip, one of the best definitely. >jayashkal, naniniwala pa rin ako na maayos din. kung hindi man ma recover yung bandang gitna nito, siguradong yung beach maibabalik pa rin ang kagandahan nito. >hi shawie, it definitely is and we hope that it will soon be refurbished to bring its best in its totality. >hi hilda, the island of boracay has other beaches which still retained a semi-private mood like the puka beach. you just really need to explore the island. 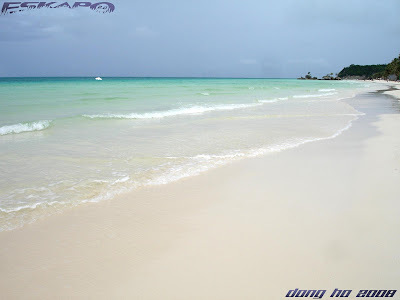 but you'll still be amazed by the white beaches white sand beach stretch. it's good to know that you're still planning to go there. >hi napaboaniya, we'll welcome you with arms wide open! >hi layrayski, yes it is. >victor, there's a lot. from luxurious hotels to cheap ones. wow! wala pa ring kupas ang ganda ng boracay. pero nakakasawa nga kapag medyo nagstay ka ng matagal sa place. 2004 ng magstay kami ng 2weeks jan. grabe! parang umay na kami. napakasarap magpunta ng boracay pag off-peak! so peaceful talaga :D namiss ko tuloy ang boracay! >salingpusa, i simply agree with you. no matter the many issues (both nature and human) about boracay it is still beautiful. but let's hope that things will even get better after some resolutions and agreements are clarified. >hi blue rose, wow! two weeks at any place will definitely make you feel bored. but maybe next time you can explore the other islands, try every water activity or just drop by the nearby carabao island. >hi bug life, thanks too for dropping by my blog. >hi carlotta, tama ka dyan. medyo unstable nga lang ang panahon. pwedeng bumagyo pero sulit na rin kasi konti ang tao. Made me miss bora more... hayyy sarap! nothing compares to the white sand of bora talaga dom. sarap maglakad at magpagulong-gulong jan. parang miss ko na agad bora ah. napaka picturisque talaga ng beach ng boracay. very enticing! kakagigil. kahit di ako beach bum, nakakaakit talaga ang appeal ng beach. >hi helena, wow! extremely beautiful. it looks very much like the ones in palawan. i like those stone walls. >hi vanessa, tama ka. sarap nga maglakad ng nakapaa sa beach side. sarap balik balikan. >allan, off peak kasi nung time na yon kaya hindi ganun ka dami. may mga oras na talagang konti lang yung tao pero pagdating ng hapon dumadami na rin. >hi doc rio, ganda ng buhangin doon. sana nga makatulong din ako sa pag imbita ng mga dayuhan sa ating bansa. >islander, oo kakaiba din kasi talaga ng buhangin. at yung lawak ng beach maeenganyo ka talaga maglakad at maligo. Amazingly beautiful! I love how beautiful Boracay is. I wish I could go there someday. My city far from the beach. Nice to see this photo. Boracay will always have a special place in my heart. Lovely photos. There a good atmosphere there, mostly at nightlife. Where did you stay in boracay, is it good facilities there?? ?